This is a map that will drive many crazy in the GOP. As the red dots indicate, Gov. Snyder won decisively in the 76th District. Eleven precincts gave him at least a 20 point margin (and some came close to a full 40; a 70-30 split). The places where the party dominated on the SE side, the NE fringe (with the Riverside neighborhood tossed in) demonstrate why the district has the shape that it does. They were supposed to win in the off year, except, they didn’t. The gerrymander failed. For party strategists, this map represents a what-if, a secret nudge of hope. But that partisan reading may miss the message. Take a look at the results for Winnie Brink. Precincts that were in the GOP column are now in her’s and what is more, they are there in decisive shape, with her winning with twenty percent margins (look at precinct 2-42, or precincts 3-77, and 3-59). Even in precincts where the Governor won big, the Brinks campaign tightened the margin (look at precinct 1-6). One can look at this as a matter of hard work, that the campaign worked and earned the win. That is certainly the case. But this is also a map of hope, of a future. Brinks strength even in the usually conservative neighborhoods points to the power of pragmatism within the City. The fact that both Brinks and Snyder win the same seats suggests a common persona, one of moderation, a look past the partisanship. There is surprisingly little of the Tea Party in this map (perhaps pct 1-21 or 1-23). The Brinks campaign modeled this moderation as well, her’s was a campaign emphasized hard-work and pragmatic solutions. Where the term limits opponents had stumbled in the blue collar neighborhoods, Brinks won comfortably, sometimes even spectacularly. And this was done without running away from her stance on abortion — a killer for most candidates a decade ago. Brinks again demonstrated that where one is moderate and hard-working, the questions on abortion can be handled. As the City explores how it should continue to develop (that long conversation between the downtown and the left out), the Brinks win maps what a coalition might very well look like. Yes, we will always have the west side but most in the City want to see it succeed. And to do that, they are willing to cross lines and work together. It’s the sweat equity of hope. And it bodes well for our City. There is lots to be said about the term limits campaign, so lets start with the most basic. Money..
To date, the $10K raised by local proponents is also about what it takes to run a City Commission race in the first place. It’s not the money that has stopped folks from running for office, but the candidate pool itself. The problem at hand — from their own literature — is that of lack of candidates, “many won’t run against an entrenched incumbent.” (Although there is a certain irony here, since most of the commissioners have been at best, re-elected once — this does not especially seem to be the definition of “entrenched,” say like a Fred Upton). The cure for entrenched incumbents is simple: vote them out. And besides the money it simply is not that hard: 6,000 votes or so would do. What is perhaps oddest aspect of the measure is that cycling through of commissioners only means that the well-funded get in. It pushes for more money in the races, more engagement by outside interests, ie. the professional interests. For a measure that is supposed to strengthen the connection between the local, the neighborhood, the “small platoons” of conservative lore, this would do almost the opposite. It certainly would not result in an environment where say, a medical clerk could successfully run. What’s that in Bing’s eye? Bing Goei’s announcement the other day that he would have a write in campaign for the 76th state house seat, the one fouled by Roy Schmidt, is certainly a move that challenges wisdom. Perhaps his business is doing really, really well and he has money to cast around. Perhaps it really is a matter of pique.Or perhaps he has something else in mind. Formally, it is hard to see how the race makes any electoral sense. With a strong Dem already on the field, there is little room to go and pick up the disaffected centrists. To do so, Goei would have to campaign against Brinks, and to date, there is little of that on the field. On the right of Schmidt (and Goei) is Keith Allard, who has been running a verbally aggressive campaign, staking out claims for right to life, fiscal conservatism, and actively drawing contrasts with both Schmidt and Brinks. But if Goei cannot pick up the center and the right wing is covered, what’s left? Even assuming a total Schmidt collapse, there are not enough votes out there to make it work, all the more with the state and region sliding to the D side at the national level. The motivation, apparently is the same as that of Schmidt (originally): the mayor’s office. And here, Goei’s campaign is anything but quixotic. The independent write-in campaign symbolically detaches him from the GOP (even if we all know where he stands), and gives him the the independent creds necessary for a non-partisan race. Plus – provided that I’ve read the law right — money raised for the statehouse run can be transferred to another political campaign. So for now, Goei rebuilds networks, gains visibility, raises money — all tools that can really help in a run for the Mayor’s office. His may not be on Lansing at all, but on Ottawa Avenue. Where is Peter Bratt when you need him? Political consultant and former resident, Peter Bratt understood the importance of data — his models became part of the Democratic redistricting efforts in 2011. It now appears that Grand Rapids and its Clerk, Lauri Parks could have used his help. 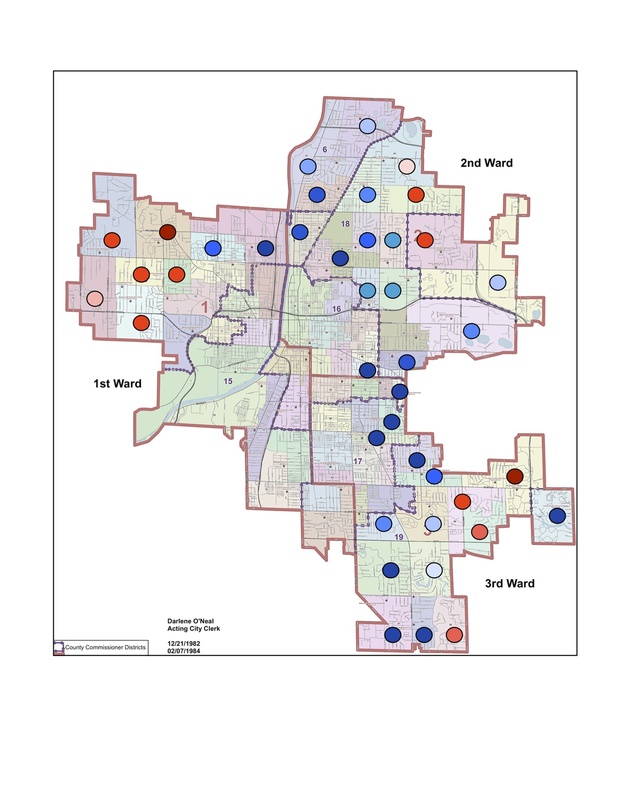 The task was fairly simple: following instructions from the Secretary of State, Grand Rapids was to change the numbering of its precincts from ward specific to a sequential pattern (so no more of having three precinct 24s, say). This would be a minor thing, or should be. The result has been problematic, however, and may require an additional fix. In her revamp, Parks redrew boundaries of several precincts. Most entailed better aligning Ward 1, Precinct 13 (the near west side neighborhood along the river from Bridge to Leonard), a more significant change took place in the far northwest where three precincts (23, 24 and 31) were combined into two, 23 and 21, basically by dividing up 24. Now this may seem arcane, but for those who track voter behavior, the merge and split means that data will now have to be consolidated into one chunk, a combined 23 and 21. This is a small loss of granular data. The larger problem, however comes with the naming of the precincts themselves. All online archive records at Election Magic or at the Secretary of State, present the data in a fixed order (ward 1 beginning with precinct 1, ward 2, etc), this generally has allowed for tracking from year to year. The new numbering system sought to give new names that resemble the old ones (e.g. in Ward 3, pct 5 becomes 55, pct 18, 68; pct 21, 71). The difficulty is that such a numbering substantially breaks down the earlier order of precincts, that order used all other analyses. Oh, what is a poor boy to do? For starters, get a key. The excel sheet gives the new number codes for the old precinct numbers. by using them next to the old precinct lists, one can sort them so archive data sets match current order or precincts. Yes, that’s confusing. It would be so much easier for data analysis had Ms Parks simply kept the order, and changed the number. Practically, what this all means is that the amateur and limited fund campaigns will need to take extra time in building their data sets. And one thing we know for sure: Peter Bratt would not approve that. To understand what’s going on, keep in mind three numbers: Kent County’s population (602,622), the minimum size for a senate distict (247,091), and the maximum (273,100). 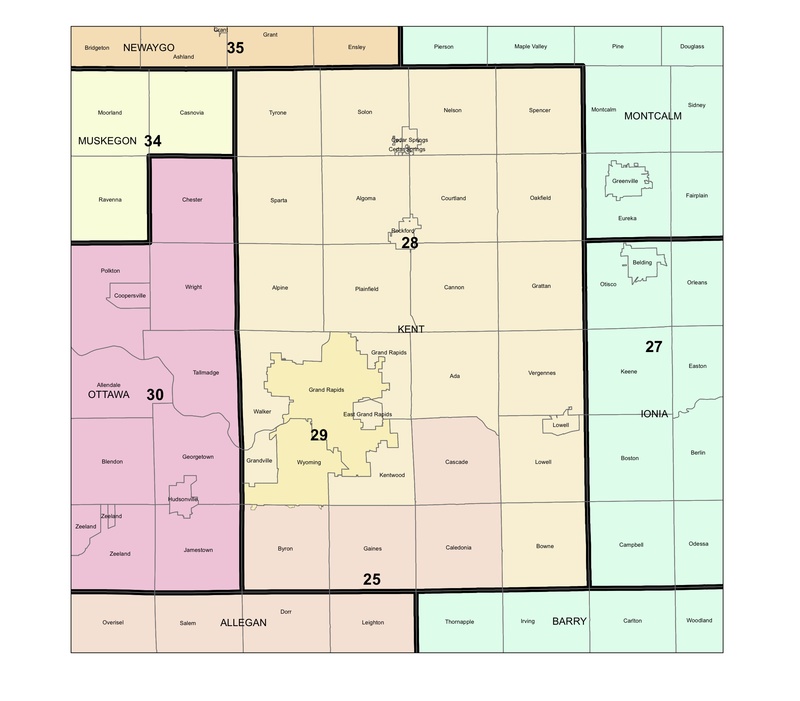 With these numbers, the county is entitled to 2.2-2.4 State Senate seats. Or to look at it another way, between 50,000 and 100,000 residents will be attached to a district outside of the county. From a Kent County perspective, the proposed map matches the districts fairly well with the underlying social reality. The city of Grand Rapids is paired with Wyoming (for Dems, a happy thought, giving at least the possibility of a win); the southern tier of townships are sent to neighboring Allegan county, again a happy match of the economic populist/libertarians; and the remaining townships form the second complete district — one strongly Republican but also with a mix of economic and social conservatives. This last would be Hildenbrand’s seat. But if this map is modestly happy for Dems, that’s a pretty good reason why it’s not likely to be adopted. Several other configurations suggest themselves for the GOP, chief would be the sending off the top two tiers of northern townships (roughly 50,000). Grand Rapids would then be paired with Plainfield, Cannon, GR Twp, EGR Ada, Vergennes and Lowell. Again, an easy district for Sen. Hildenbrand. The second seat would then be Wyoming, Kentwood and surrounding western and southern townships – a district more in line with social conservatives. There are other configurations, but as to sending folks away, the GOP would be advised to keep their social conservatives on the west intact (Alpine down to Byron Center). As sure as robin in spring, the hiring of Census workers can only mean one thing: time to again contemplate carving up the political landscape. And really, nothing is quite so delicious. Especially in Michigan with likely loss of at least one congressional seat. A whole new set of winners and losers is ready to be created. And of the first maps out, is that from Menhen, at Swing State Project. There’s plenty of discussion on the proposal on state-wide aspects, here. For those on the west side of the state, things get especially interesting. The second district (Hoekstra) becomes the Ehlers seat, with urbanized Kent County (Grand Rapids, Wyoming, Kentwood, East Grand Rapids) replacing Ottawa County. Meanwhile, the Third now becomes the “Hoekstra” home, packing together Ottawa, Allegan, Van Buren and about 40 percent of Kent). Even were the arrangement not prove workable, it nonetheless can be considered as very useful sort of thought experiment. If the map looks familiar, it should: this is essentially the same redistricting solution used for assigning State Senate seats in he county. So the 29th (Bill Hardiman, R-Kentwood) includes Grand Rapids, Kentwood, Cascade and some exurb/rural townships to the east. The rest of Kent County becomes the 28th (Mark Jansen, R-Gaines) surrounding the 29th like a “C.” Same topology here in the congressional redesign. As a Kent County partisan this division can look problematic, especially as the region wrestles with issues of development and of educational equality. These are contentious enough as it is; this political division could serve to increase the distances between cities and suburbs in ways that work against its best interest. Indeed, practically speaking, this may be the real point of difficulty for any such plan: both parties maintain real interest in controlling their own destiny, as they have to date. Thus, the pressure will be to vote for a unified Kent County. This is perhaps the most obvious direction that redistricting will take if the Democratic party can control the process. A District with both Muskegon and Grand Rapids in it would raise the core urban issues with much greater force. Minorities gain voice. The experience of representation in Grand Rapids demonstrates how urban issues can sway even otherwise conservative representatives. That these two cities are also two bastions of Democratic strength in the region makes this a natural combination for Democrats. At first, the division of Kent County looks counter-intuitive to the region’s interest. Yet, as in the State Senate such an arrangement can potentially serve to expand and extend the region’s clout. This will be its great appeal to those engaged in regional planning. The risk is no less obvious: potentially the County could not be represented at all, and civic leadership would then have to depend on outsiders, an awkward situation if for no other reason than pride. A look at raw numbers suggests that this worst case scenario may not be as likely as some fear. In a Grand Rapids – Muskegon district, Kent County would continue to provide something close to two-thirds of the total vote, thereby making the region a natural home base. For the new 3rd, things are a little more dicey. Suburban/exurban Kent County would contribute approximately 40% of the base to the new district, and more importantly be home to some of the deepest Party pockets. The centripetal pull of fundraising will keep any candidate close to the heart of Kent County. And likely as not, also be a resident , as well. likely provide a candidate for the seat. The result for regional planning would be two members of congress tightly identified with the interests of Kent County. This would be an improvement from the present situation. In terms of selling redistricting plan such as this, the potential doubled representation from Kent County will rank high. On the Republican side, the plan would mirror the present division in the Kent County party, between the social conservatives on the west — the party of the Lands, Voorhees, and generally Ottawa County; and the economic, leaning to libertarian conservatives of the east — this is the party of Ada and Amway, and also of Justin Amash. As in te Democratic Party, the division between east and west is present and active, here best thought of as that of Ada and Grandville. The present weakened state of the Kent County party not only has left a number of local Republican party members shaking their heads, but has been increasing the rumblings below deck. As the national party tilts toward and ideological purity, the battle will almost certainly intensify between the economic and the social conservatives. This division is already present in State House 86, encompassing the social conservatism of Walker and the economic leadership of Ada Township. The redistricted 3rd invites a similar sort of battle line. A civil war among the GOP is not necessarily in the Democrats best interest; such a civil war is as likely to result in the ideological pure winning. A region where the pure win promises less in terms of the deelopment the region requires for its long-term growth. Such a plan as this is bold, but some obvious drawbacks do need to be mentioned. A district that cuts out the money powers from downtown is going to have some difficulty getting through. Perhaps the region is at the cusp of really going metropolitan, but for many there still remains the hegemonic ideal: a unified political-social-philanthropic culture. This sense of the region as a region extends across party lines. It is not at all obvious that even a Democrat in the 29th State Senate seat would go along with a plan that fractures the congressional seat. 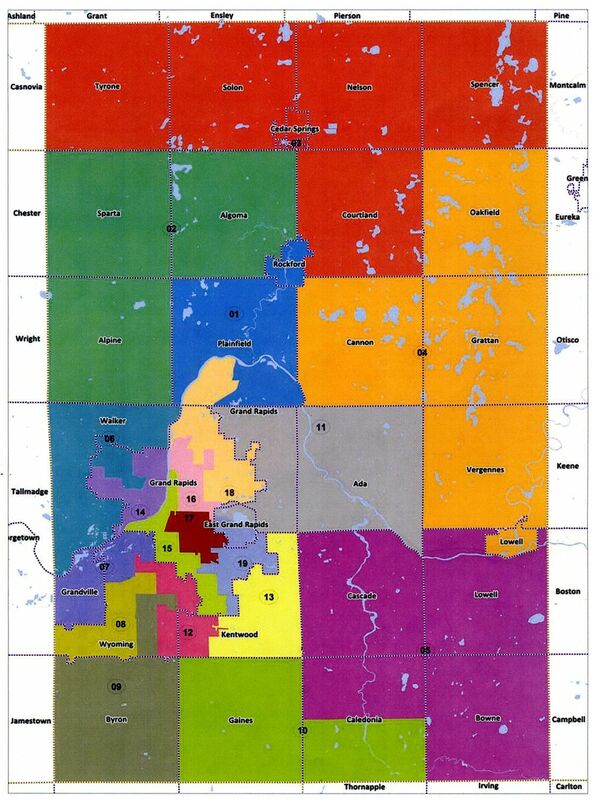 Redistricting plans are better when they follow existing patterns of political or socio-economic organization. What ever the virtues the partisan gains from a redistrciting plan such as this, it remains far more useful to have the congressional district and the metrolpolitan area(s) correspond with one another. The questions of recovery and development that are likely to be ours in West Michigan ask for pragmatic leadership. Thus, while a Muskegon-Grand Rapids axis makes sense, being part of the same SMSA (Standard Metropolitan Statistical Area). The northern lakeshore counties share a different set of problems. Representation that follows basic economic interests is simply going to be more efficient in helping those interests and communities deal with Washington. Lastly, on practical terms, a revised Muskegon-Grand Rapids district ought to naturally incude Newaygo. Newaygo has become part of the west Michigan metro area. For the same reason, Ionia ought also to be part of a west Michigan congressional district. The plan from Swing State Project is not the first to imagine the shape of things to come, but it does begin a useful conversation on how we can better structure our communities for better representation, and continued economic development. One of the odder things underway in the current election season is the absence of the Dutch Reformed in the contest for Michigan State House District 75. For more than a generation this seat has not only been the possession of Republicans, but of a succession of members of the Christian Reformed church: Peter Kok, Paul Henry, Vern Ehlers, Bill Byl, Jerry Kooiman. They were a string of politicians notable for their vision of public servcie; they were men of faith, but not in the sectarian form of the Christian Right; in short their’s was a very distinctive political culture. In 2006 Christian Meyers sought to take his place in this line but lost to Tim Doyle. And as we know, Rev. Robert Dean won instead. This year we have two exlicit Catholics and a (religiously) unknown running: T J Carnegie, Dan Tietema and Michael Burdo. The only connection to the older Dutch community is in Tietema’s last name. This golden chain has been snapped. So what is going on? A set of hypothesizes suggest themselves. 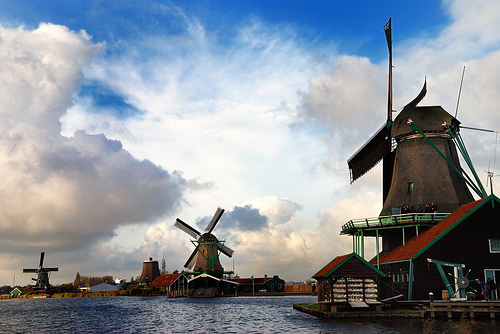 Is the Dutch political culture of a generation being eclipsed? Perhaps. The signs are clear that the community, long a feature on the city’s SE side, is shrinking. As the numbers have waned, there is also evidence that historically staunch neighborhoods (and they still are pretty staunch) have also begun to trend for conservative blacks. E.g., both Third Ward city commissioners are black; and Rep. Dean is a very conservative Democrat, as well. There is also emerging in the city an east-side Catholic political culture. In the 75th, the Catholic neighborhoods of the north end have been recognized as the deciding neighborhoods. In the third ward, the old Dutch neighborhoods (those out towards Calvin) were balanced by the minority precincts; the neighborhoods north of Fulton were the tie-breaker. And these were Catholic. But until now, it has been a diffused Catholicism — these more suburban neighborhoods lack the political culture of the west side, or of the public service motivation of the old Dutch. Each of these potential long-term trends will receive further exploration. But for the moment, 2008 makes clear the Catholic boys are in town, and throwing long.